With her mind in a whirl, Juliet leaves for Italy to represent the Arabellas in a prestigious chocolate competition. The prize money will help her family's struggling business, and Juliet figures it's a perfect opportunity to forget Leo…only to find him already there and gunning for victory. As they compete head-to-head, Leo and Juliet's fervent attraction boils over. But Juliet's not sure whether to trust her adversary, or give up on the sweetest love she's ever tasted. After having read Teri Wilson’s Unleashing Mr. Darcy, a modern day retelling of Pride and Prejudice, I put this particular author under my radar. I was delighted when UNMASKING JULIET was released, because I was curious to see how she would retell the story of Romeo and Juliet. I was not disappointed! UNMASKING JULIET is set within the romantic backdrop of Napa Valley, one of my most favorite places in the world! I know that the wineries, restaurants and people there are highly competitive, which makes this place the perfect setting for this particular story. The Arabellas and Mezzanottes are two prominent chocolate-making families with a long-standing feud. Juliet Arabella may be a teensy bit naive, but what I love about her is that she’s passionate in what she does. The spark is truly lacking in her love life until she meets a mysterious man in the vineyard one night. Too bad he’s a rival! Chocolatier Leo Mezzanotte is back in town, and his family expects so much from him. Little did he know that crossing paths with the beautiful Juliet would make him fall hard and flame the family feud ever more. I adored this story! I thought Ms. Wilson did a great job setting up the family rivalry. Juliet and Leo both have opinionated, meddling family members. I loved how she created delectable scenes that were sensory feasts! I’m not going to lie. This story made me crave chocolates! I could almost smell it while reading. Sweet and romantic with just the right amount of heat to melt your insides a bit, UNMASKING JULIET showcases many Romeo and Juliet elements while providing a few unexpected twists along the way. Grace is a blogger at Sweet Spot Book Blog and enjoys reading swoony romance novels with strong heroines and broken heroes. She adores anything & everything British, is a health-nut, and is obsessed with Phantom of the Opera. Great review. This sounds like a book that I could totally enjoy. I love books that always have a sweet ending. Plus not to mention the two main characters have a great chemistry between them and that's always important. Hi Grace! I hope you enjoy this one. Juliet and Leo really do showcase some sweet chemistry! This sounds like a nice read, hopefully they don't di at the end. You hooked me with th word chocolate. I tend to enjoy retellings of classic literature, so this might be a good fit for me. Wonderful review, Grace! Grace..you had me at chocolate truffles, and family business..all of the romance and story are just icing on the truffles!! Right?! It always cool to see how one would re-tell their story. I love how she's doing these retellings. I read the first one. Glad this second one is really good too, Grace! Unleashing Mr. Darcy was so cute, and I think I loved this one a smidge more! This sounds great Grace :) Chocolate and romance! I can't see a better combination. And wine! Chocolate, wine, romance and Leo Mezzanotte! He's yummy too! Brandee, I hope you like these books as much as I have. I'm already looking forward to the next one! 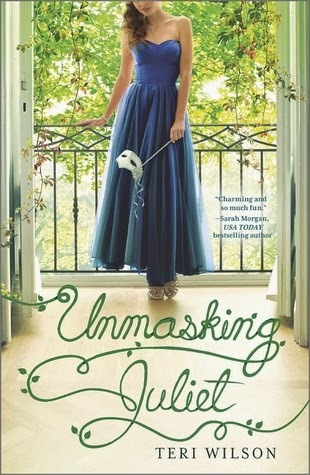 Unleashing Mr. Darcy is on my TBR, and I think I'm going to enjoy Unmasking Juliet as well :) Great review, my dear!! I'm glad you had such a great time with this one. I confess I didn't know about it but I never read something set in Napa Valley so I'm intrigued. lovely review! How fun! This does sound like a wonderful book. It was my pleasure, Braine! Thanks for having me! Awww, sounds like a fantastic retelling of R&J, which is a classic love story. Lovely review Grace!